Tlws y Cerddor - Composer's Medal. 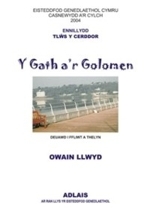 Translated from the Welsh, 'Y Gath a'r Golomen' means 'The Cat and the Pigeon - two apparently well-known adversaries often seen on the pier in Bangor, and photographed by Owain Llwyd in 2003. Inspired by the Eisteddfod requirement of a duo for flute and harp, the composer decided that the harp should portray the cat, and that the flute should portray the pigeon. The underlying tension of the situation is exploited in this brilliant, unusual, dramatic and amusing piece.